It’s time again to explore the possibilities of combining great garments with beautiful accessories. Usually I like to stick to a simple palette of 3 main colors and perhaps a few accents, but today things got a little carried away. It all started with an awesome mixed media necklace including cord, chain, and bead fringe with a wild variety of colors. What I wanted to do was focus on the red, orange, and green of the cords at the center of the piece. Although the necklace itself has a great summer vibe, finding summery clothes in these colors would be a challenge. The trick would be to keep it fresh instead of looking like fall. Things were going really well with a lovely red dress and top, orange shoes for each, and some fun handbags. Then I started adding accessories to go with both outfits, and suddenly it was a perfect rainbow of deep shades. It still looks pretty summery, and there’s nothing wrong with a little (or a lot) of color! 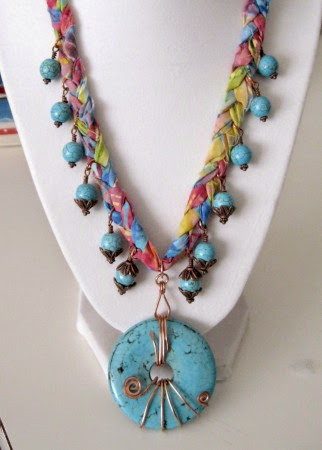 Combine beads and fabric in one gorgeous piece with the Turquoise Dreams necklace tutorial from Jewelry Making Journal. If you love bangles, this Rainbow Wrapped Bangle Project from love u madly is worth a try! It would work great in any color combination or ombre pattern. Block your colors and get a lot of texture in one piece with a tribal necklace tutorial from DIY fashion blog make it & fake it. If you prefer a little fringe over a lot, the understated beaded fringe necklace project from A Common Thread is a great way to show off some favorite colors. A funky Poly Rope Necklace project from dollar store crafts looks like a reverse of today’s necklace design. Switch out the poly cord and rhinestone trim for hemp and brick stitch, and you’ve got a gorgeous statement necklace! The Going Tribal fringe necklace tutorial from M&J Trimming just needs a few strands of Picasso seed beads or Java glass, and it’s perfect! And these are my favorite Polyvore collages featuring this month’s best picks. If you're ever stuck for inspiration on outfits, color, or style in general, these collage artists have you covered! Do you like to style your outfits with multiple colors? It is so good to be back! I was hit with a really wretched cold awhile back, and was couch bound for days. Even when I’m feeling up to it, I never do beadwork while sick, so I’ve fallen way behind on designs, posts, and everything else. Now that I'm back to normal, I've got my to-do list before me and I’m working on catching up. Going back to work really knocked the wind out of me for a second week, so I’m taking it easy right now with some super easy beaded rings for my top secret project. The big reveal is just around the corner, and I can’t wait to share the news! Meanwhile, I’m up to my ears in projects. On the last bead tray, which seems like years ago already, I was working on some new embroidery pendants. Although I haven’t yet had the time to finish stringing the new medallions, I did finish my second fish leather experiment, and it turned out great! I wanted to do something a little more special than just a simple sliding knot for this piece, which includes one of Kristal and Cynthia’s designer seed bead mixes from Artbeads.com, so I went with a spiral rope necklace instead. Check out the Bead & Button blog for my full 'review' and thoughts on fabulous fish leather. Although every season has its good and bad sides, spring is one time of year where the division is greatest. There are beautiful, fragrant flowers, and allergy triggering pollen. There are wonderful bees and butterflies flitting about, as well as a steady march of spiders, hungry caterpillars, and the year’s first mosquitoes. Its interesting how much we can love some bugs, but not others. Naturally, some of the insects we like most are also the most beautiful - like dragonflies. Recently I splurged on a strand of gorgeous Czech dragonfly coins, and it was definitely money well spent. The simple design and Picasso finish brings to mind all of the things we love about nature. Although I have some secret designs planned for them already, I still wanted to experiment a bit with color and see how well these beads can play with others. I started slow with a simple palette of brown and green, going for a near match of the colors in the coins. Transparent lime green and dark topaz look gorgeous together, and provide a simple backdrop for the subtle changes in the Picasso finish. This Pond Water palette would look great in a flat stitch with a random pattern, perhaps as a cuff with a coin focal. Next I wanted to incorporate some clear water, so I started with transparent aqua blue. This color is incredibly intense, and could overpower the super soft green of the coins, so I added some soothing medium topaz to complement the dragonflies. Reflecting Pool would work well as a rope and pendant, especially with a repeating pattern to represent waves of cool water. For the final palette, I started with another complement, but in a whole new direction. Instead of a light-filled green, I grabbed some transparent dark emerald. The deep green really brings out all of the colors in the coins, and the addition of dark blue iris adds a shimmer just the a dragonfly’s wings. Evening Thunder definitely calls out for something bold and fringe-covered. Do you have a favorite spring insect? How does it inspire your designs? 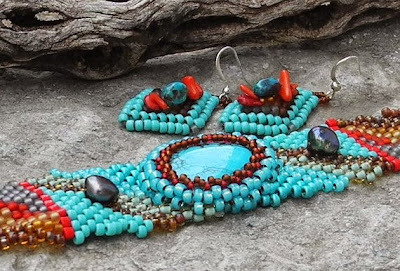 Working with seed beads gives us unlimited possibilities for color and texture, and nobody combines them quite like beadwork artist Cheri C. Meyer. 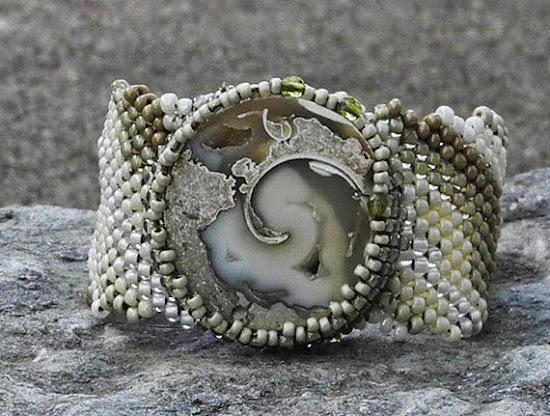 Her freeform bracelets, watches, and statement necklaces are something to behold. Inspirational Beading: When did you first get started with beadwork? Cheri: I was a creative kid with a big imagination growing up on a farm in northern Minnesota. My siblings were much older than me so I had a lot of time by myself to explore, play and use that imagination. The art of playing and creating was and is high on my “to do” list. I have been making jewelry for over 30 years and about nine years ago discovered bead weaving. I fell instantly in love with this ancient technique; the weave locking beads together, mixing colors, making up designs with color, the texture from the woven beads and making the art of this bead weaving technique my own. Cheri: Yes I have the free form beaded bracelet and I wear it! I remember how difficult it was to make, manage the thread, when and where to place beads. I concentrated so hard on making it perfect and to look exactly like the example that I lost all the fun I wanted to experience. I learned something about myself from making that first bracelet; my brain does not work well following someone else’s pattern. But once I started to let go of all those expectation and discovering my own rhyme the joy and excitement started, thing fell into place. Inspirational Beading: What technique do you turn to the most? Cheri: All my work is done with the peyote stitch and I free form all my designs. I usually have a special stone, piece or color I want to work with, so I gather my seed beads and other embellishments that I will use and start to bead. My design process is pretty intuitive, I have learned to let go of most expectations, focus on my inner voice and let it take over the design process, and it has never been disappointing. It’s also a process I have learned to love, its meditative, each new bracelet is fresh, exciting and one of a kind because there is no actual pattern to follow accept for the one that was inspired inside me, I take risks with my designs and that is also exciting. Cheri: Nature is my favorite inspiration, different landscapes when I travel; looking closely at how nature mixes its colors together and of course the stones nature produces. Also, going on nature walks, I come home with tons of ideas and sometimes I even find something I can use in my jewelry. I’m inspired by all beads, different cultures and their traditions, photos from the past, photos of nature, the southwest, vintage buttons and art of all forms. Pinterest, a photo sharing site, has also become one of my favorite places to go and it right from my computer. My boards reflect wonderful color mixing ideas, awesome nature photos, and art and just about anything imaginable for that inspirational dose. Inspirational Beading: What’s the most interesting or unique thing about your design process? Cheri: They are all one of a kind because I make them up; all my jewelry is created from how I see the world, what inspires me and the result is a fun, enjoyable and satisfactory process. This intuitive process is letting my inner guide take me through the process when making a piece, no right or wrong, just having fun, trusting and expressing myself, there is no limit on what I can create or use in my jewelry. My hope, when others see my jewelry is to be inspired, to trust their own instincts and to think outside the box. Cheri: I love all earth tones, but have learned to use all colors and love them. My gift and favorite thing is mixing colors, I like taking chances when it comes to mixing those colors together! 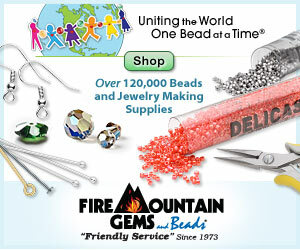 Inspirational Beading: What are some of your favorite accent beads? Cheri: I love Czech glass, they do a beautiful job with a large variety of colors, styles and their history of making glass beads is so interesting. Working with a variety of colors and objects is my favorite thing. I don’t limit myself; there are endless possibilities from meaningful stones, metal, fiber to found or handmade pieces or focals. I could walk a beach and find a stone I could use in a design or a really big find would be a piece of sea or tumbled glass. From a walk in the woods I have used birch bark I have found on the way. 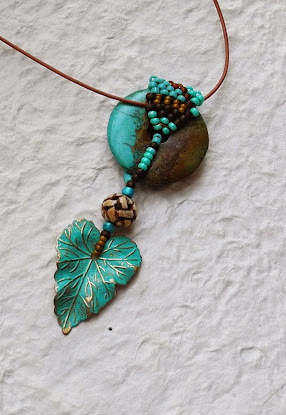 Also reusing old jewelry, vintage buttons or just someone else’s junk or throwaways, I have used colorful yarn, fossils and I have done metal work to incorporate into my bead weaving. Whatever comes along my path I will notice and process how I could use it in a design? Inspirational Beading: What is the most exciting design in your shop right now? What makes it special? 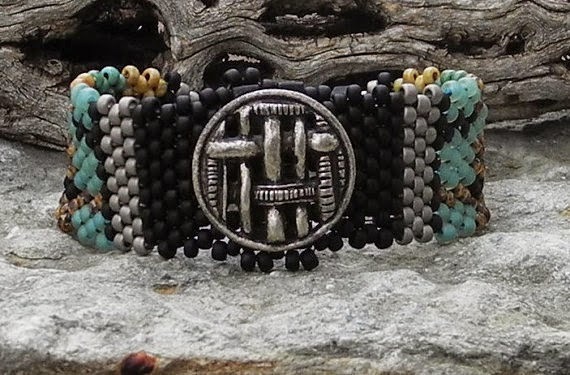 Cheri: It’s hard for me to choose just one but, with this new listing I used the vintage button focal to inspire the beading design for the bracelet. I reused a piece from the past and gave it a new life with a bit of color. Something so simple but yet I found it fun and exciting to create. Cheri: Anyone who wants a dose of inspiration around their wrist! I have worked with men, women, ages 10 to 90. Each piece is a part of me; I’m sending the beauty that I see and a little piece of art into the world. All my pieces have a name with a special message to inspire and empower. You can see more of Cheri’s freeform designs in her Etsy shop, and website, CheriCMeyer.com. To see the latest inspirations from her workspace, following along with Cheri’s blog, and on Pinterest. Happy Mother’s Day, beaders! I hope that all of the moms out there are getting lots of love, or that you’re able to spend time with a mom that you care about. Whenever this special holiday comes along, I always think of a bouquet of dandelions. They are the one bouquet that truly comes from the heart - hand picked by tiny hands for the absolute pleasure of it. Some may think of dandelions as weeds, but we love them at our house. They’re natural, resilient, and beautifully yellow - and they are the first food for bees and other pollinating insects each spring. Not to mention how much fun they are once they go to seed. In honor of dandelions, bees, and all things Mom, I’ve put together a new mood board that speaks of spring delights. With an abundance of greens and yellows, these picks are warm and cheerful. Perfect for an outdoor mother-daughter or mother-son tea party. Finding beads to create these looks was delightfully easy. It turns out that dandelions and spring greens are a popular inspiration. I combined two-toned beads and materials with dandelion motifs and symbols of friendship. These components would make delightful necklace and charm bracelet sets! What flowers are your favorite to give or receive? Do you ever use them in your work? There’s no such thing as too many beads. Big or small, natural or manmade - there’s always room for more. Even if you have to get rid of something else first! Who needs more shoes when you can add more beads to your closet, right? Whatever your tastes are, you’re sure to find something inspiring at The Bead and Button Company. Not to be confused with the magazine of similar name, this UK bead shop specializes in supplies for jewelry making and scrap booking. They carry a wide range of beads, buttons, and embellishments for crafters, with colors and shapes that are hard to resist. The fabulous folks at The Bead and Button Company have generously offered a giveaway to Inspirational Beading readers, so that you can sample their delightful wares. One lucky reader will receive a $50 gift certificate to spend on the beads and supplies of their choice! For a chance to win, stop by The Bead and Button Company to browse their selection. Then head back here to Inspirational Beading and leave a comment, telling us which of their beads or materials is your favorite. Anything goes! One winner will be drawn on Thursday, May 15th. This giveaway is open to international readers. Important: Comments must be posted here on Inspirational Beading to qualify, but no log-in is required. Please make sure to leave a contact method in your comment if you do not have a profile with a public email address. For security, you can type your email like so: username AT yourmail DOT com. Incomplete or duplicate entries will not be included in the draw. Good luck and happy beading! Update: This giveaway has closed. This week I’m juggling multiple projects, including a secret experiment using Rizo beads in a gorgeous transparent cobalt. I’ve paired them with pearly white for a soothing ocean look, which really shows of the glow of the glass. I’m also starting a new medallion pendant. My wonderful assistant chose a blue and green Egyptian face cabochon for this piece, and matching lime green felt. We were off to a great start! Then he chose creamsicle orange as our first round of color - I can’t wait to see what else turns up! Last week’s pendants turned out great, although I haven’t had a chance to add their cords yet. I’m still experimenting with fish leather, and it’s probably my favorite new material this year. Some new colors just arrived and they’re really calling to be stitched. I've also been keeping careful notes for an upcoming post that will reveal some beader-friendly tips on using this interesting leather. We are almost one week into May and I couldn’t be more excited. The caterpillars are out, which means butterflies won’t be far behind. Temperatures are climbing (hello beach weather!) and some of the best flowers are just starting to think about blooming. I’m looking forward to lots of summer inspirations, and looking to my bead stash for projects to come. My absolute favorite thing right now is a new strand of cobalt blue white hearts, which I just picked up from Happy Mango Beads. I’m not sure why it’s taken me so long to stock up on my favorite beads in my favorite color, but they’re here now. They’re definitely going to look good in some Egyptian designs, but ocean inspired pieces aren’t out of the question either. …Especially when I’ve got these fantastic scallop shell pendants! These huge beauties are made from carved bone with just the right patina, and I can’t wait to see what they can do. I grabbed these from Fire Mountain Gems, and I’ve been hoarding them while I wait for the sun to come out. One of them definitely needs to meet with some aqua and topaz. Last but not least, I’ve got my eye on some new Czech glass buttons from Artbeads.com. I’ve decided to start experimenting more with purchased buttons, including making a little exception to the no-metal rule for glass buttons with metal shanks. These little buttons are all glass, though - and just the right size for summer bracelets. The floral designs are especially inspiring, and that lime green is too pretty. What are your favorite bead muses right now? One of the best things about most beadweaving techniques is that there are so many different ways to use them. Variations are what make a simple stitch into a gorgeous design, whether it’s adding a new type of bead to the mix, or just adding a few twists. In The Art & Elegance of Beadweaving, stitch variations are explored in ways not seen anywhere else. In this book Carol Wilcox Wells has compiled a gorgeous collection of projects based on some favorite stitches, taking them to a whole new level. After a brief introduction to the materials and tools used for beadwork, readers can jump right into creating. There are four to five projects each for chevron chain, bead crochet, herringbone, peyote stitch, and spiral rope. The highlight of the book is an entire chapter on beaded beads with ten projects to try. 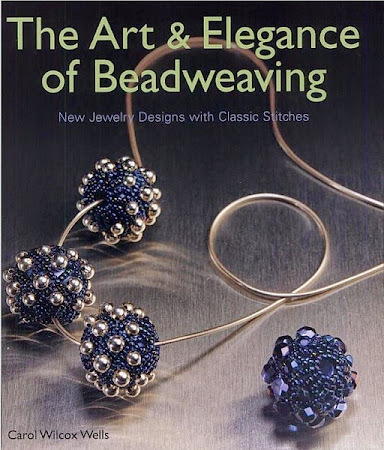 Each section is filled with beautiful photos of beadwork and jewelry designs featuring the relevant stitch, from some of beading’s greatest artists. Contributors include Marcia Decoster, Martha Forsyth, and NanC Meinhardt, plus many more. If you’re looking for ways to spice up your beading repertoire, I highly recommend looking for The Art & Elegance of Beadweaving at your local library. It is full of gorgeous stitch inspirations! The 2014 Ugly Necklace contest is coming to a close just a few short months away, and I can’t wait to see all of this year’s finalists. I had a great time challenging myself to make something even uglier than last time, and I added some elements this year that are way out of my comfort zone. It was a blast! If you’re not familiar with the contest, you can check out some of the past entries at Land of Odds. Entering an ugly necklace design also involves writing a poem to go with it, adding a little extra challenge and fun to the process. Since I used UnFinishedObjects to create my 2012 entry, I wrote a poem about the rush to make new things and avoid all that extra stuff that comes with beading, like picking out stitches on failed experiments. I think a lot of beaders can relate! Another great giveaway has come to a close. Thank you so much to everyone who entered! This month our prize was a gift certificate to House of Gems, which offers a great selection of beads and findings, including gemstones, pearls, and pavé. 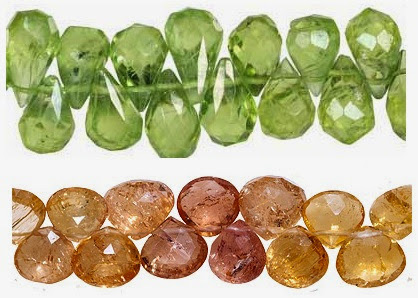 Our winner is Diane, who loved the gemstone selections like peridot, citrine, and Imperial topaz. Congratulations to Diane! A huge thank you goes out to House of Gems for sponsoring this month’s giveaway. For another chance to win some goodies from House of Gems, stop by their Facebook page to enter the Mother’s Day jewelry making contest. Good luck to everyone who enters! 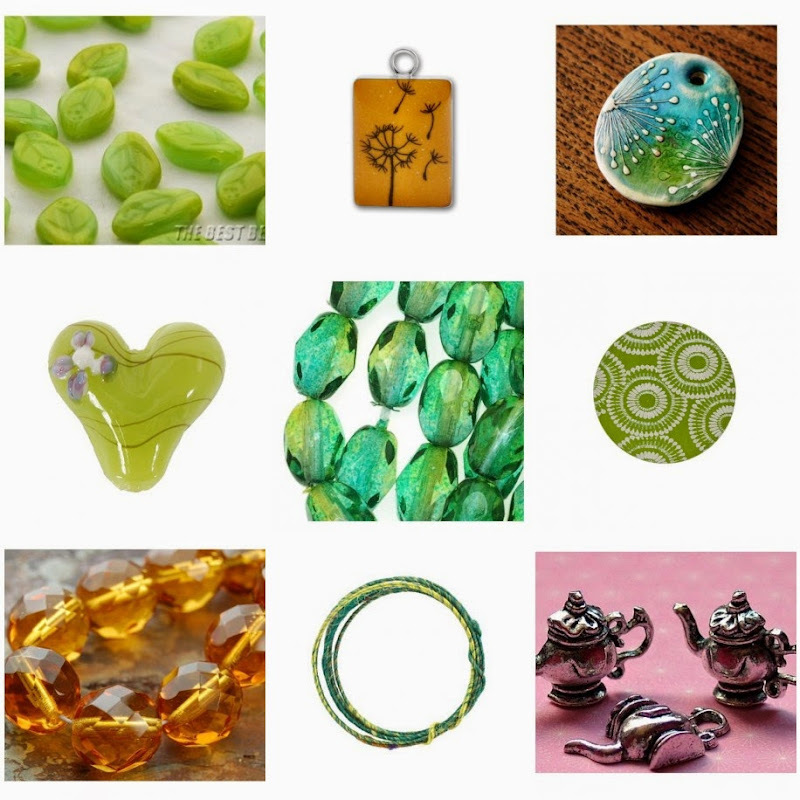 You can also get weekly inspiration with their #BeadingFriday feature on Twitter and Google+.